A four-year-old girl was swept out to sea at Changi Beach on Sunday, and died while on the way to the hospital. Nur Nadhirah Atiqah was found about 15m from the shore after a stranger swam into the sea to help look for her. The young girl was at the beach with her family for an early Father's Day celebration, according to The New Paper. Her heart had stopped beating when she was rescued from the sea, but was restored when a female stranger administered CPR to her. She was unable to survive the subsequent trip to the hospital, however. Nur Nadhirah had been playing in the sea with her cousins at about 1:15pm when a wave washed over her and she went missing. 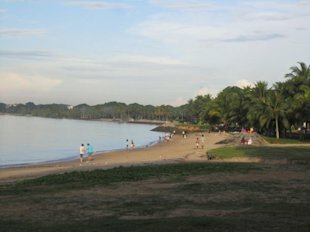 An emergency call was then made, and an ambulance was dispatched to Changi Beach. Her father, Muhd Imran, told Lianhe Wanbao that he had allowed her to play in the water with her cousins as one of her sisters was unwell. Her mother had been taking care of her younger sister. "After she was lost, I kept shouting her name and a man went into the water to find her," he said, adding that after she had been found and brought back to shore, another stranger gave her CPR to revive her heartbeat. According to reports, doctors later found that there were foreign objects blocking Nur Nadhirah's throat. Muhd Imran said, "I watched her take her last breath. If only I had been more careful, she would not have died. I will have to carry this regret with me for the rest of my life."